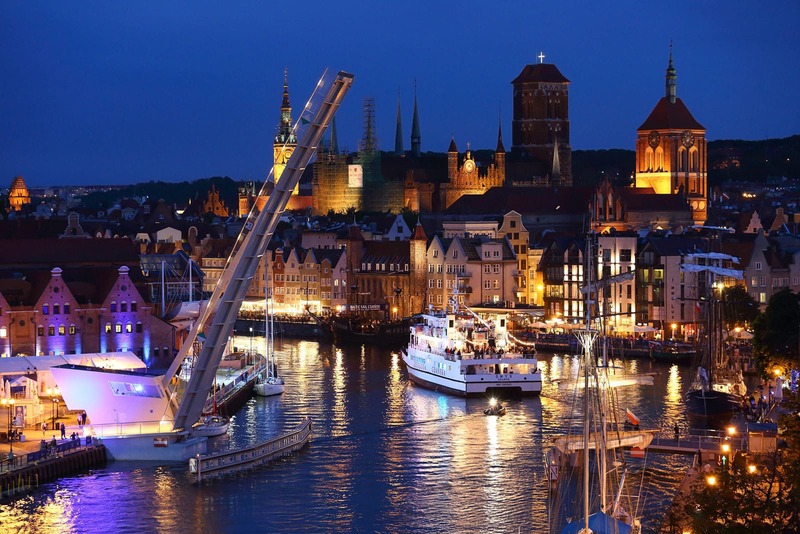 Are you planning a tour around Gdańsk, Sopot or Gdynia? Are you already there not knowing how to plan your stay, where to begin your visit? Are you expecting a visit from your friends or family, and don't know where to take them out, what to show and recommend to them? Our guide will help you reach the places worth seeing in the whole Tricity, get to know the most important historic buildings and monuments, facilities and tourist attractions of Gdańsk, Sopot and Gdynia. Each tourist city has its own landmarks, its must-see places. In Paris it's The Louvre and The Eiffel Tower, in London - Big Ben and Buckingham Palace, in Warsaw - Sigismund's Column and the statue of The Warsaw Siren, in Cracow - The Cloth Hall and The Wawel Castle. What is the symbol of Tricity which must not be missed? Tricity is not a homogeneous urban entity, but three cities, each of them with several, if not more, of their characteristic features. 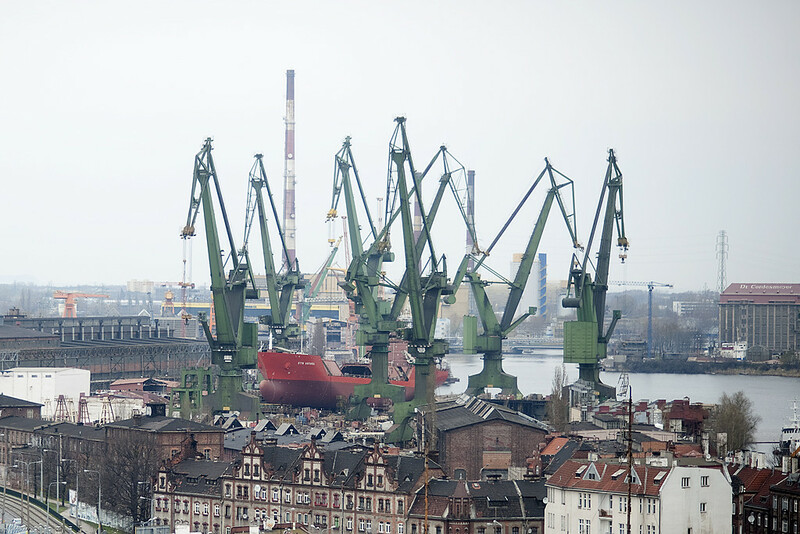 It is hard to imagine Tricity without Neptune Fountain, the majestic Żuraw crane and the Shipyard cranes - the inherent elements of the panorama of Gdańsk, without the Sopot Pier or Gdynia's cliffs, 'Błyskawica' ship and 'Dar Pomorza' tall ship. 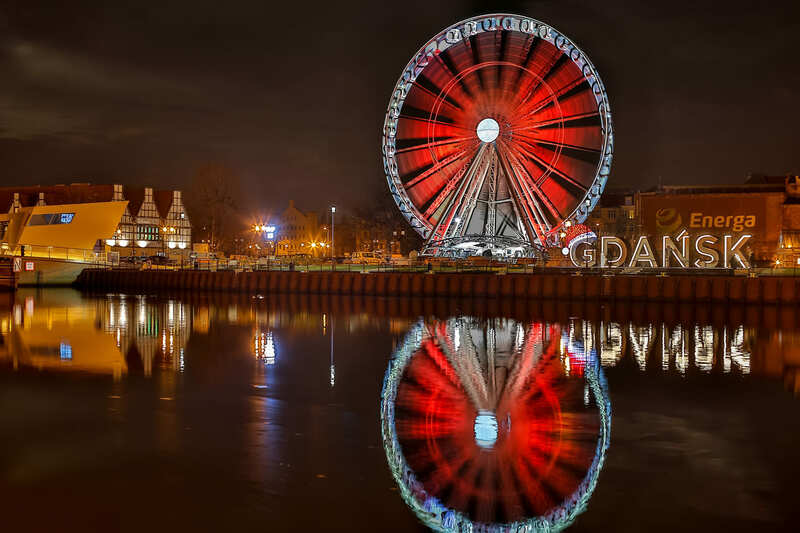 It's good to bear in mind, though, that, apart from historic buildings and other popular places, each of these three cities, Gdańsk, Sopot and Gdynia, have their less touristy gems which we recommend to discover during your personal excursions. One thing is certain - in Tricity you will not be bored: you can go night-clubbing, sunbathe by the seashore, taste the local specialities and take advantage of such wide range of activities, that it may even make you seasick! Here you will feel the sand under your feet, breeze on your skin, you will hear the call of the sea and you will the wind blow in your sails. If you decide to visit Tricity during the holiday season - it is advisable to arrange your accommodation well in advance: (see our recommended hotels, guest houses, holiday apartments and campsites). Most of them offer online booking. Before the trip it is good to choose the transport options. 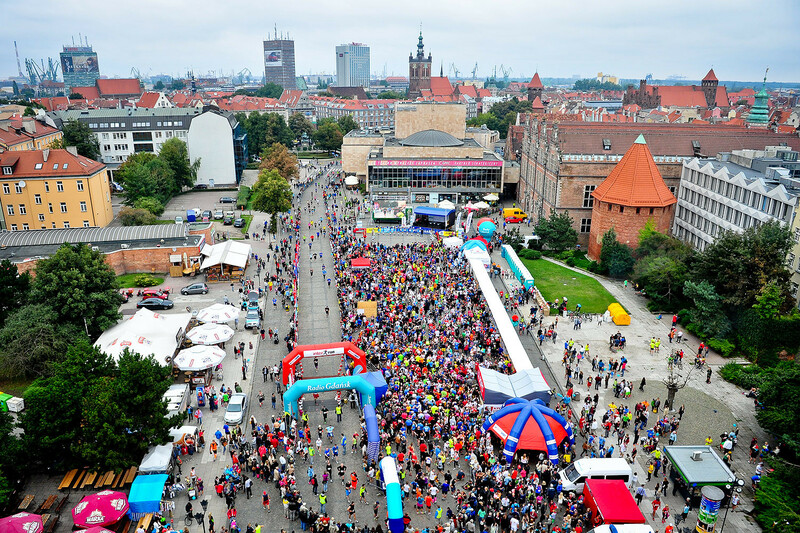 Tricity is easily accessible from any large city in Poland. Choose your own means of transport, bus or train. The PKP train timetable is available on our website Polski Bus coach service has lately become a popular means of transport There are flights to Gdańsk departing from several cities in Poland. If you are planning your trip by plane, arriving at Gdańsk Rębiechowo airport you can use a taxi or public transport, checking the city bus timetable straight after your arrival During your stay in Tricity do not forget about the Rapid Urban Railway (SKM) commonly used by the city's inhabitants You can also go on a sea cruise: take the 'water tram' which will take you to Hel. If you wish to thoroughly explore Tricity and acquire more profound knowledge of the city, you should go on a guided tour, choosing a guide from the list in our catalogue. You will find our map helpful while you are sightseeing and Gdańsk 4youmobile application will make finding your way around even easier. If you need a printed map and brochures go to one of Tourist Information Centres, where you will find plenty of promotional materials and expert guidelines. 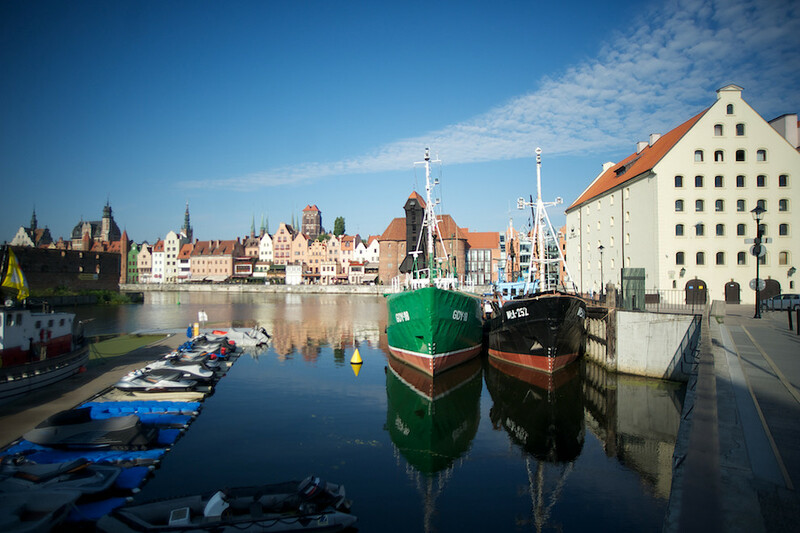 A thousand years of history and picturesque seaside location makes Gdańsk considered one of the most beautiful cities in Poland and in Europe. 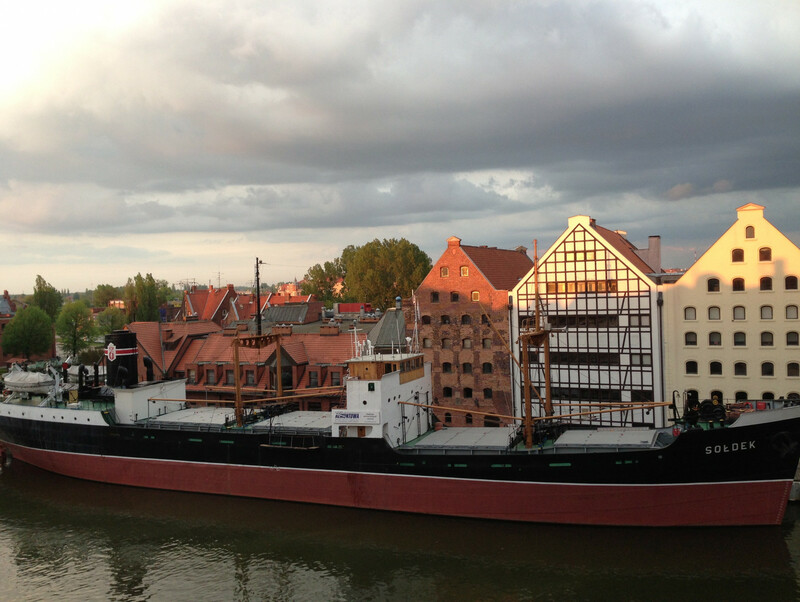 Located in the north of Poland, at The Baltic Sea coast, at The Motlawa and The Vistula river estuary and the Bay of Gdańsk, it is a lively cultural, scientific and economic centre, with a large commercial port - an important point of marine industry. 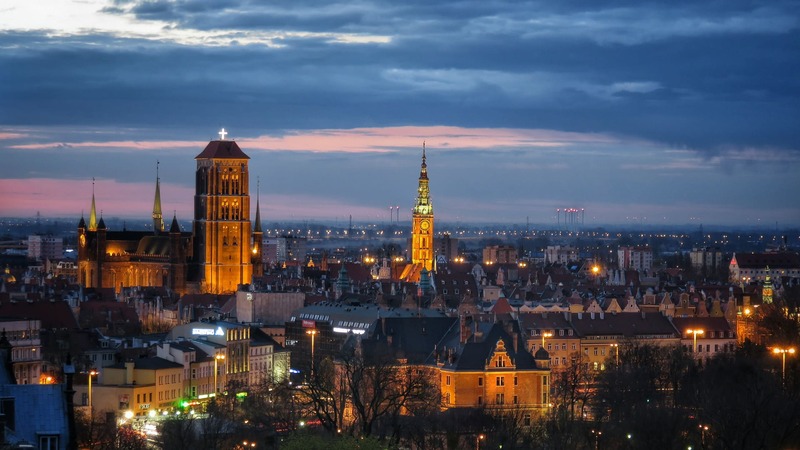 It is popular with tourists, both from Poland and abroad, who are curious about the city's history and explore its monuments, absorbing its marine nature. 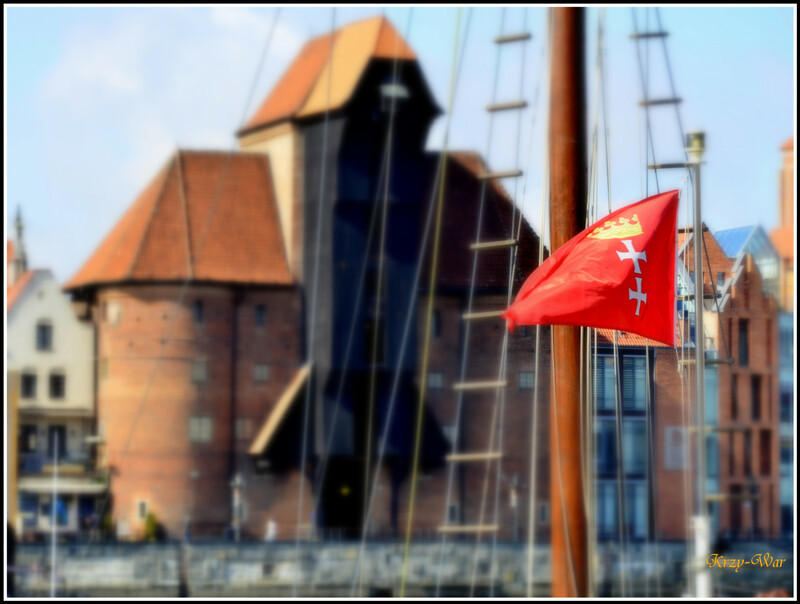 Gdańsk is the city of freedom, where the ideas of Polish companionship and solidarity were born. The unique "genius loci" can be felt among the Old Town terraced houses, among the shipyard cranes of Young Town, on the sandy beaches and post-industrial halls. 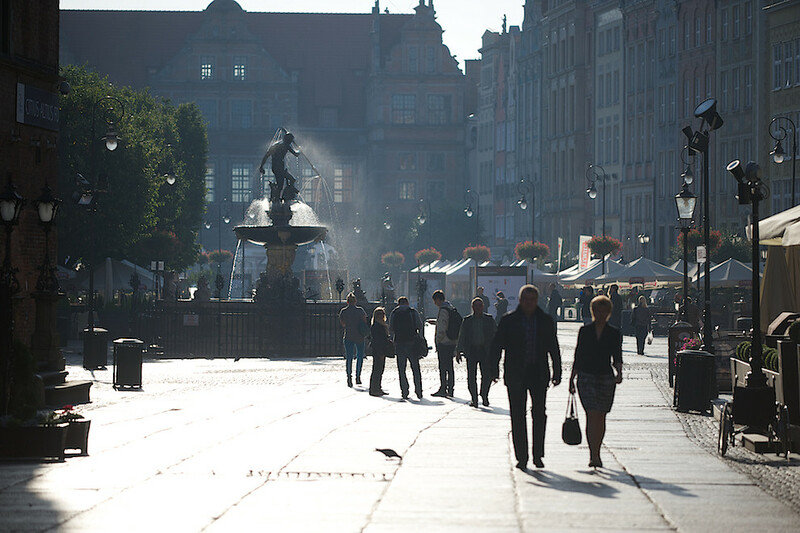 The omnipresent freedom in Gdańsk inspires actions, changes people and space they live in. The present day Gdańsk is a city open to new ideas, keeping pace with the changing times; traditional yet at the same time very modern. 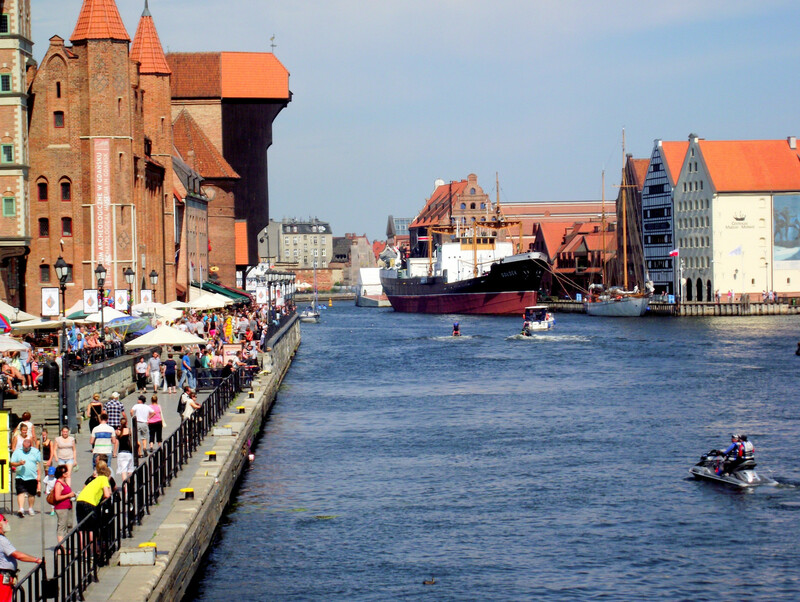 The thousand-year-old Gdańsk is considered to be the most monument-packed city of "Baltic Europe". Most of the monuments in Gdańsk are located near the most representative passage of Main Town District - the Royal Route and the streets parallel to it, along with the promenade, the Motlawa Long Embankment (Długie Pobrzeże). 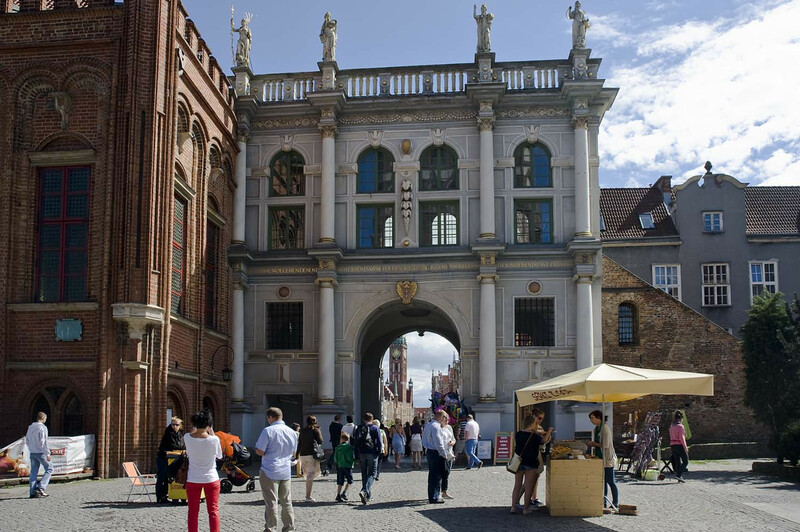 The best place to start sightseeing of the historic part of Gdańsk would be the Upland Gate (Brama Wyżynna) and the the Royal Route stretching beyond it through Long Street (Ulica Długa) and Long Market (Długi Targ) towards The Green Gate (Zielona Brama). In the Green Gate you will find the seat of Pomeranian Tourist Information Centre (Pomorskie Centrum Informacji Turystycznej). Having crossed The Green Gate, you'll find the Prison Tower (Wieża Więzienna) and Torture Chamber (Katownia), called the Barbican of Gdańsk, inside which The Amber Museum is located The Amber Museum is planned to be re-located to the northern end of Granary Island (Wyspa Spichrzów.). Just behind it, there is the Golden Gate (Złota Brama) and, next to it, The Court of the Society of St. George (Dwór Bractwa Świętego Jerzego) . Within the area bordering on one side with Wybrzeże Theatre and the Barbican on the other, there is a square called Targ Węglowy, a venue of numerous concerts and other cultural events. Just behind The Golden Gate there is a magnificant view on the Royal Route. The Route is lined with charming, restored houses, whose original construction dates back to the 16th and 17th century. We can see gothic references here as well. The houses used to belong to the most prominent patricians, merchants and senior city officials and spacious apartments were rented to Polish kings. One of the most beautiful houses at Długa Street is undoubtedly The Uphagen's House (Dom Uphagena) - which houses one of the branches of the Museum of the History of Gdańsk. All these magnificent buildings are overshadowed by the beautiful and monumental Main Town Hall (Ratusz Głównego Miasta), the most impressive and most valuable secular building of old Gdańsk, the seat of the city authorities. The dome of the tower, measuring 80 metres, is decorated at the top with the metal, gilded statue of the King Zygmunt August. The interior, meticulously reconstructed, is also worth a visit. (There is an online animation showing the history of The City Hall development. Opposite The City Hall there is Tourist Information Centre, office of PTTK Gdańsk and the souvenir shop with postcards and albums of Gdańsk. You can also hire a guide here. 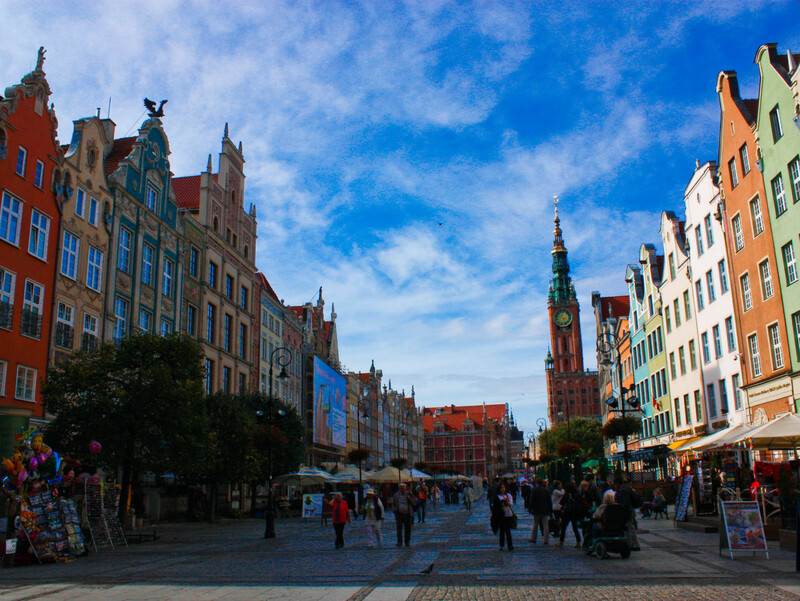 The heart of Gdańsk, unlike many cities with their central squares, is the Long Market, which along with Długa Street in the 13th century functioned as a merchant route. Here, The Neptune Fountain - symbol of Gdańsk, which has been in front of The Artus Court since 1633, is situated. Nearby, there is the beautiful Golden House (Złota Kamieniczka) and the New House of the Court (Nowy Dom Ławy) with The Lady from the Window ("Panienka z okienka") - a young girl dressed as a 17th century maiden who greets the passers-by every day at three past one o'clock p.m. Tip: There is a place on the Long Market from which you can spot three Neptune statues at the same time - try to find it! If you would like to feel like you are there now - take a look at the Panoramic View of the Long Market. 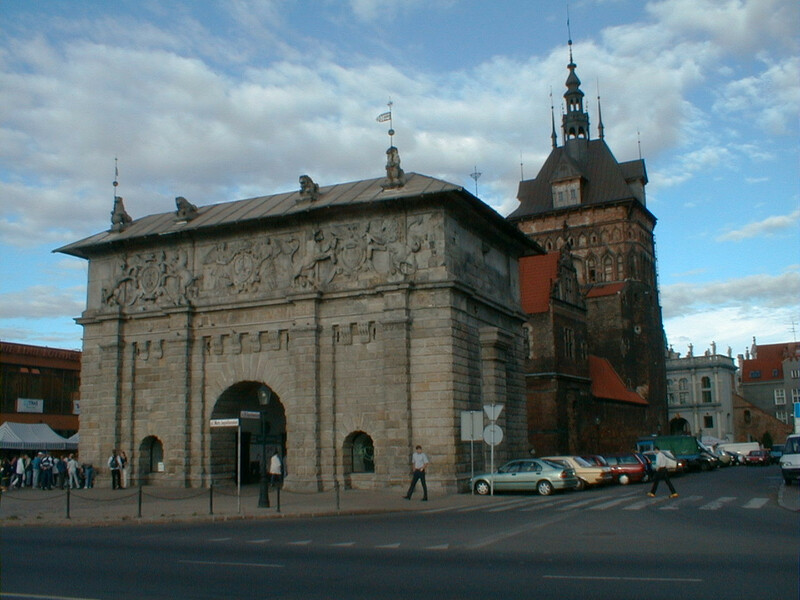 Walking towards the Motlawa river, along Long Street, you reach the Green Gate - a branch of the National Museum of Gdańsk. Passing the Green Gate, you will reach The Long Embankment, where your attention will be drawn by Żuraw,- the oldest preserved port crane in Europe and the iconic edifice of Gdańsk. Further on, going over the Green Bridge you can cross the Motlawa river and get to Szafarnia Waterfront, the city's marina and the Lead Island (Ołowianka). Tourists like to stop by the bridge which is a popular viewpoint and a perfect spot to take a photo. Turning left behind the Green Gate, you can continue your stroll along the Motlawa river. 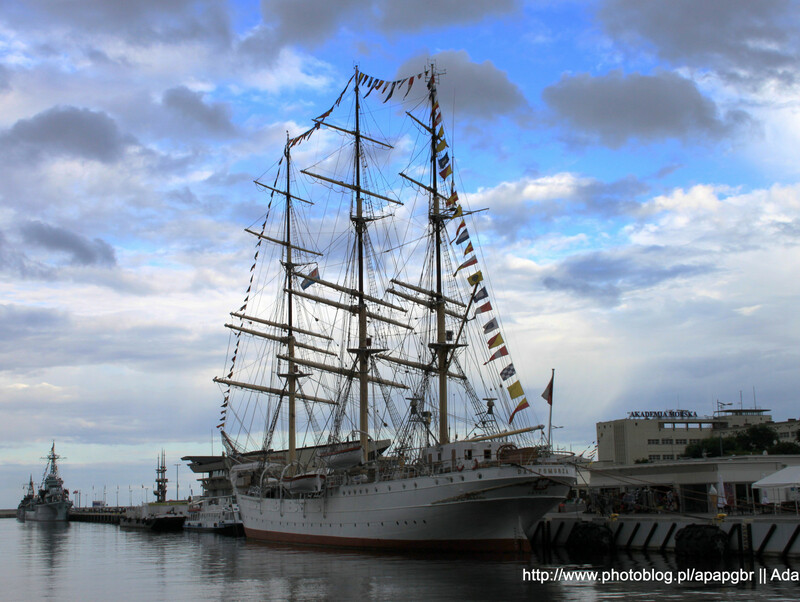 You will go past the harbour of Gdańsk Shipping Company ( Żegluga Gdańska) where sailing vessels call at and depart to Sopot, Gdynia or Hel Peninsula. 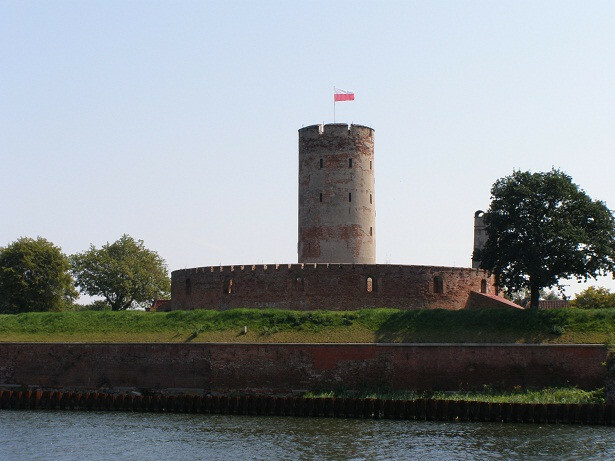 A little further, next to Baszta Łabędź (Swan Tower) during the summer holiday season there is a stop of 'water tram' and pirate cruise ship "Galeon Lew". Passing the row of buildings where souvenir shops and restaurants are located you reach the majestic Żuraw - crane, which used to serve as a point for trans-shipment and for putting up masts on ships. It also served as the city gate. Inside there is a reconstructed and fully-operating drive mechanism - an enormous wooden wheel, in the past powered by the strength of men's legs. The building adjacent to Żuraw crane (the branch of National Maritime Museum) is a modern house, yet designed to fit the historical facade of old buildings around, which houses the Centre of Maritime Culture (Ośrodek Kultury Morskiej) - the newest branch of National Maritime Museum, opened in 2012. The building adjacent to Żuraw crane (the branch of National Maritime Museum) is a modern house, yet designed to fit the historical facade of old buildings around, which houses the Centre of Maritime Culture (Ośrodek Kultury Morskiej) - the newest branch of National Maritime Museum, opened in 2012. 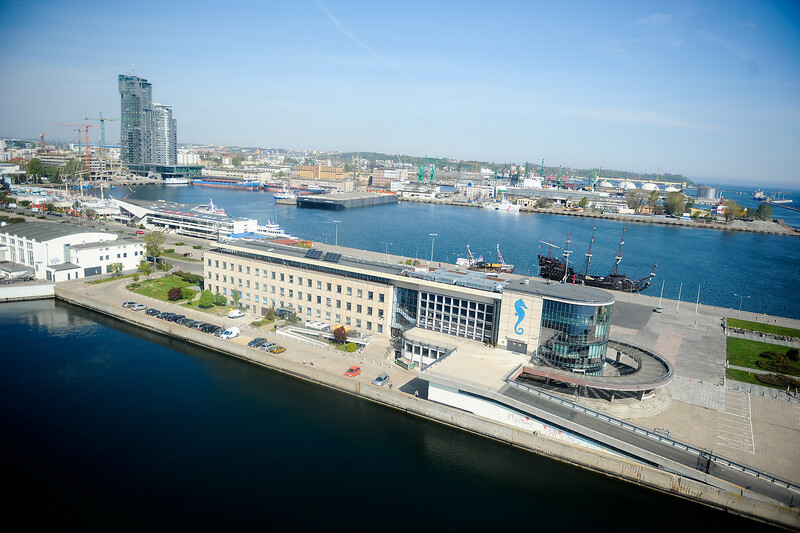 The main seat of National Maritime Museum is situated on the opposite side of the Motlawa river on Lead Island in three granaries of historical heritage: "Panna" "Miedź" and"Oliwski" Another part of Maritime Museum is 'Sołdek' - the ship berthed at the Motlawa river bank, the first seagoing ship built in Gdańsk Shipyard after World War II and one of the main attractions of the city. On the opposite river bank there is Granary Island (Wyspa Spichrzów), the city marina with sailing boats and, along the port canal, Polish Baltic Philharmonic located in the building of the former19th century power plant. Close to the philharmonic there is AmberSky ferris wheel. You can take it to admire a wonderful city view. Transport across the river is possible on the seasonal ferry caleed Motława and you can go on foot using a new footbridge. Close to historical city center near Motława river ypu can find a new Museum of The Second World War. 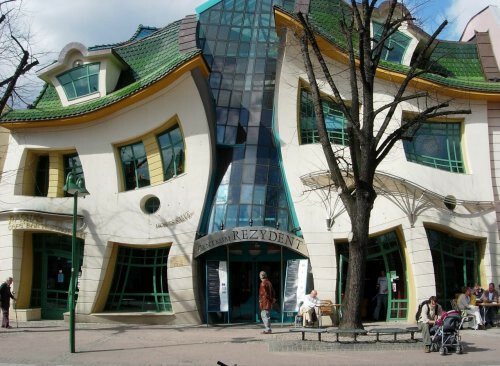 The fantastic shape of building catches touritsts' attention. The heart of the museum is a main exhibition situated 14 metres underground where almost 2 thousand exhibits have been collected. Walking along the Long Embankment it is worth to head towards the gothic St. Mary's Gate (Brama Mariacka)leading to one of the most scenic streets of Europe - St. Mary's Street. Its old Gdańsk-style architecture is manifested by rows of terraced houses decorated with gargoyles and narrow, richly ornamented facades. The houses once belonged to wealthy merchants and goldsmiths. Just behind St. Mary's Gate there is the Archaeological Museum. 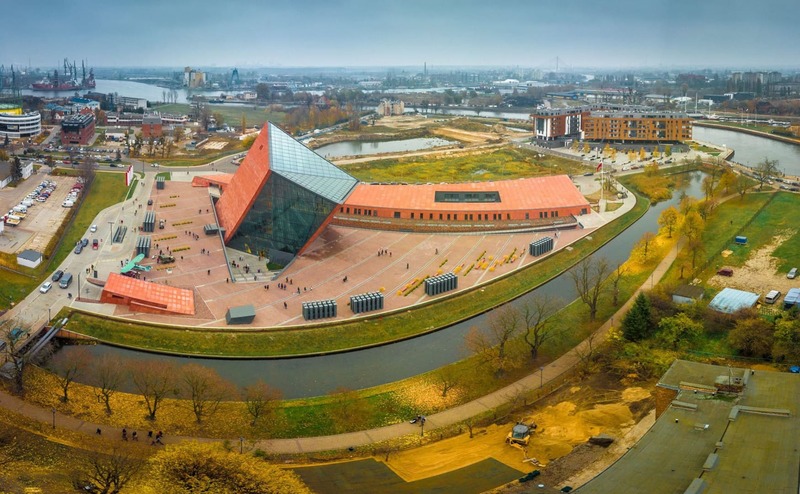 the biggest museum of this kind in Northern Poland, with its collection of over 27,000 archaeological, ethnographic, numismatic and wildlife exhibits. 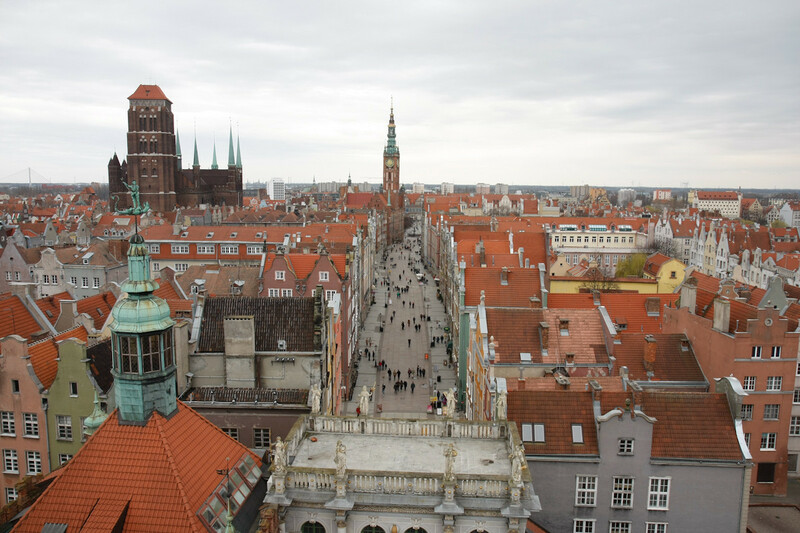 The Museum has also its observation tower, where you can admire the view of the panorama of Gdańsk. St. Mary's Street, narrow and full of amber and jewellery stalls and workshops is surmounted by the huge, monumental temple: St. Mary's Church, one of the largest brick churches in the world is frequently referred to as The Crown of Gdańsk From its 77,6 metres high tower , which you have to climb almost 400 steps to get to, the city panorama can be viewed. After leaving St. Mary's Church we recommend to take a walk along Piwna Street, the most dynamic street in the area, where new restaurants, cafes and clubs spring up and multiply like nowhere else. It has undoubtedly something to do with the location of nearby Fine Arts Academy (Akademia Sztuk Pięknych), partly occupying the interiors of another historic building - The Great Armoury (Wielka Zbrojownia) From there, it is just a few steps to The Royal Chapel ( Kaplica Królewska), the only baroque sacred structure in the city centre. Opposite the Chapel, at the corners of Grobla I Street and Św. Ducha Street in 2009 there appeared The Fountain of Four Quarters, with four lions symbolising the city of Gdańsk. Passing through the interior of The Great Armoury or going around it outside, through the lovely Teatralna Street, we will reappear at Targ Węglowy and in front of Wybrzeże Theatre, which, along with Teatr Narodowy in Warsaw and Teatr Stary in Cracow is one of the most renowned national theatrical institutions in Poland. Next to Targ Węglowy there is Targ Drzewny, dominated by the statue of the King Jan Sobieski the Third. From here you might want to head towards Korzenna Street to see The Town Hall of the Old City (Ratusz Staromiejski), with its beautifully ornamented Bourgeois Hall and the former Mayor's Office In Korzenna Street you can see Jan Heweliusz statue and the most contemporary tourist attraction - The Love Bridge, which was created in July 2011 and modelled on similar ones existing in other European cities. 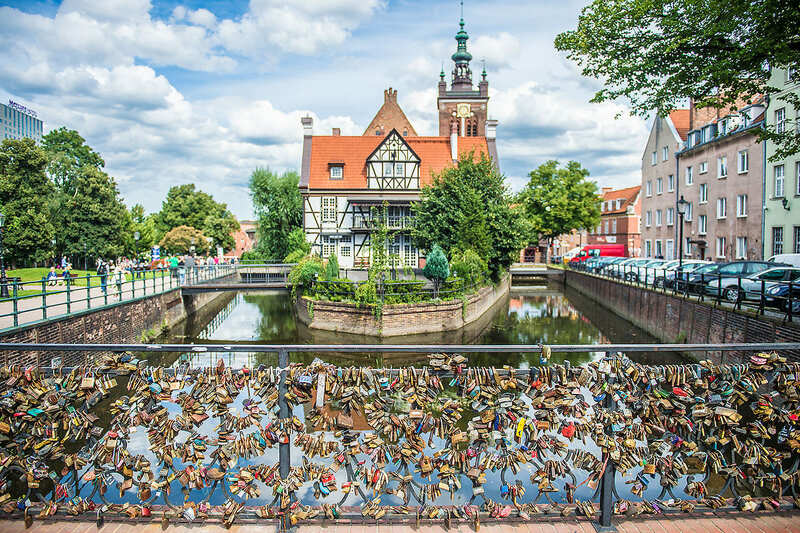 On both sides of the bridge over Radunia canal there are thousands of padlocks attached, each with the names of lovers on it. 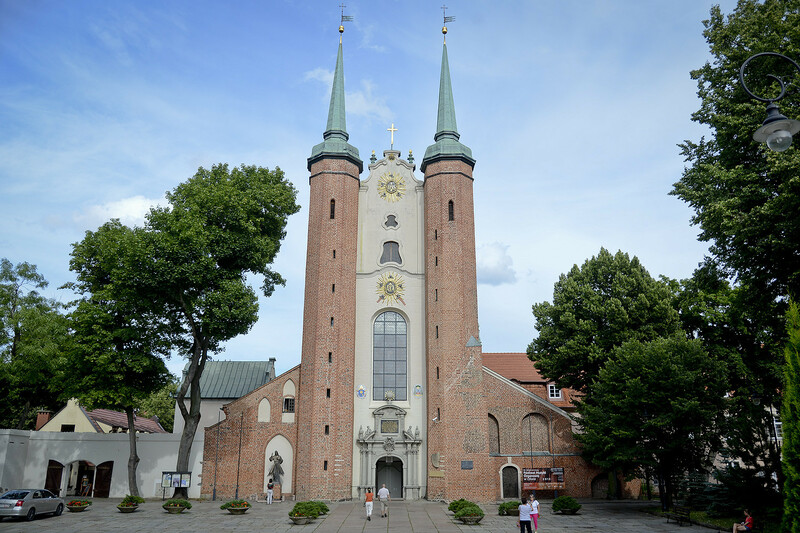 In the heart of Gdańsk there are also the following churches we recommend to see: St. Nicholas Church, the oldest church of Gdańsk, built at the end of the 12th century and St. Catherine's Church, the oldest parish church in The Old Town, referred to as 'Matrona Loci'. 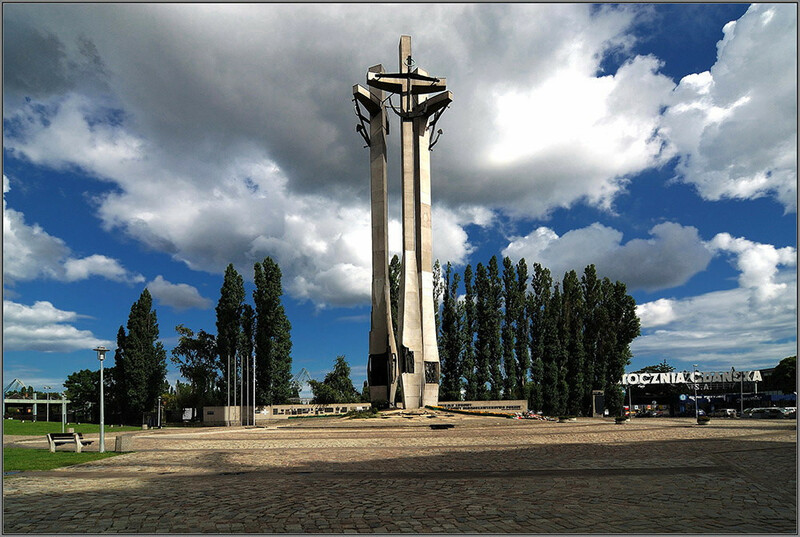 In the Solidarity Square, not far away from the spot where in December of 1970 the first three shipyard workers were killed, there stand a symbolic construction consisting of three anchors and three crosses - The Monument to the fallen Shipyard Workers (Pomnik Poległych Stoczniowców). It is also here, in November of 1980, where the movement of "NSZZ Solidarność" was established. At present, most of the shipyard's operations were transferred to the Ostrów Island on the opposite bank of Martwa Wisła river, and the former shipyard premises are used mostly by private investors. The area called Young City (Młode Miasto) is designed to become the ultramodern future district of the city's trade and services. Its integral part is the European Solidarity Centre (Europejskie Centrum Solidarności), a museum and conference venue devoted to "Solidarność" movement, planned to be opened in 2014. The exhibits to be displayed in European Solidarity Centre are currently stored in the basement of the headquarters of National Commission of NSZZ "Solidarność"at Wały Piastowskie, housing the "Roads To Freedom" exhibition. Behind the Main Railway Station (whose architecture catches the eye of all travellers and tourists), you can find The Stronghold Fort (Grodzisko) - a post-military complex. At its peak, crowned with the Millenium Cross, there is another viewpoint of the city panorama. On the site of the former fort there is Hevelianum Centre - modern educational and scientific centre, where by means of interactive exhibitions one can explore the world of science and history. From the Main City, passing the Shakespearean Theatre (currently under construction) you can visit nearby National Museum, walk across the Lower Town ( Dolne Miasto) to see Żubr Bastion. The Vistula Mouth Fortress (Twierdza Wisłoujście) is a must-see, as well as Westerplatte - both the sites of the outbreak of World War II. See the layout of the defence points . The changes in the development of the Westerplatte Peninsula in the years 1646-1976 might be seen on the specially created animation. 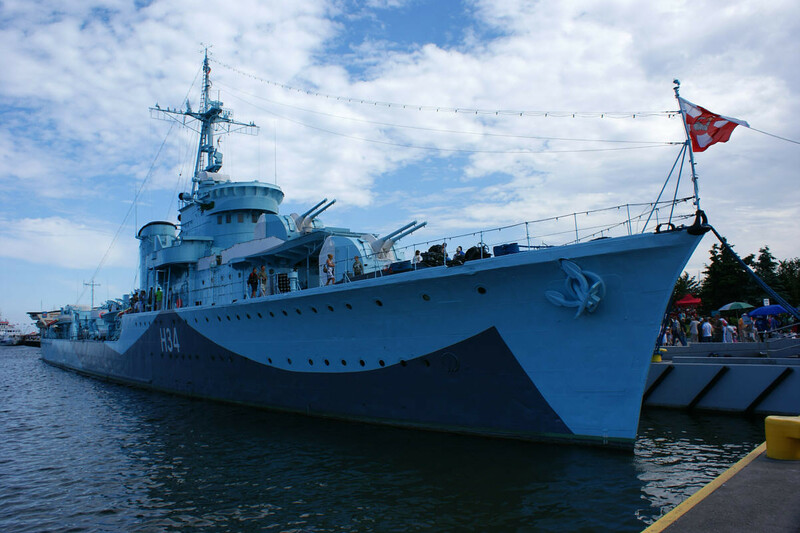 Since both Westerplatte and Vistula Mouth Fortress are difficult to get to on foot, we recommend going there by bus 106, by tram -tram routes- or take a cruise on a pirate ship. At the Long Embankment, apart from Galeon Lew, near the Baltic Philharmonic, there is another vessel: "Czarna Perła" ship. 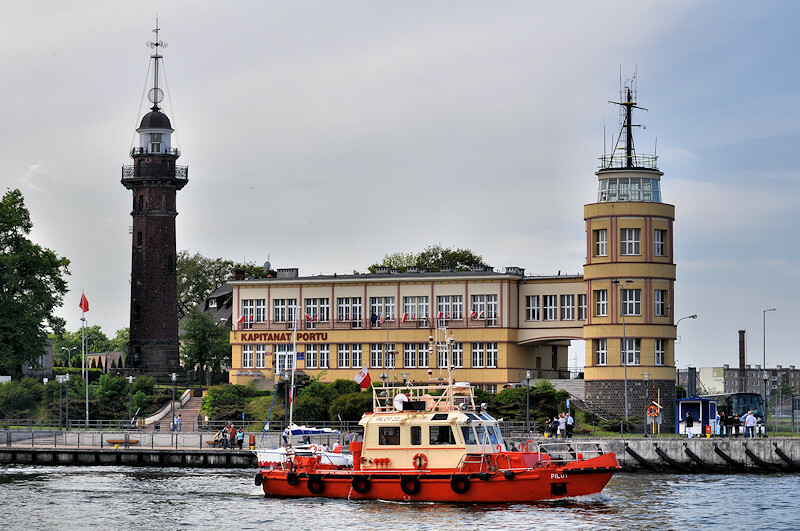 Returning from the peninsula it is possible to take a ferry from Vistula Mouth Fortress and cross Martwa Wisła river to Nowy Port district and visit the 27 metres high Gdańsk Nowy Port Lighthouse, with its unusual historic instrument - a time sphere. 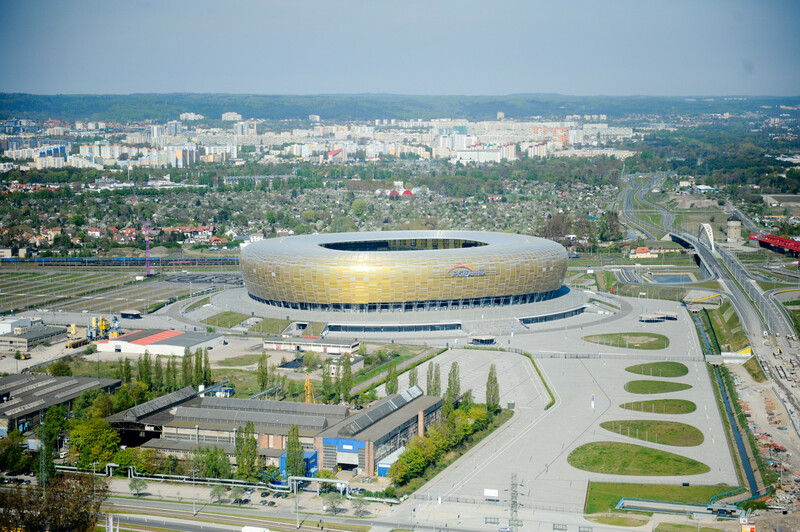 From there it is quite near to the largest sport facility in the Pomeranian region - Stadium Energa Gdańsk, because of its design called 'amber arena'. Built for the Euro 2012, the stadium is now the seat of Lechia Gdańsk football club. Football fans may step into Lechia Museum. Next to the stadium there is a modern congress and exhibition centre - AmberExpo - the host of the biggest trade fair events. 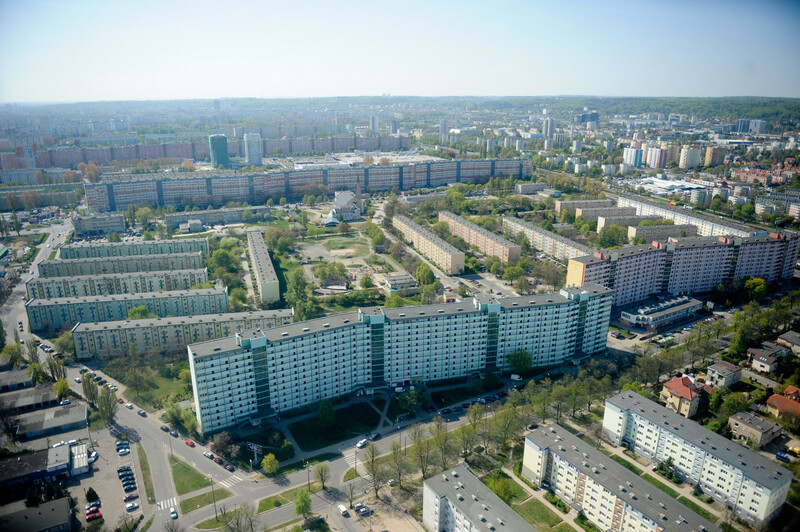 Nowy Port and Zaspa districts are also famous for their unique blocks of flats called 'falowce' - the name referring to their shape imitating the sea waves, the longest block with as many as 16 staircases and inhabited by 6000 people. Zaspa is worth visiting also for another reason - here you can see a beautiful art gallery of monumental painting. It would be a big mistake not to visit one of the prettiest areas of the city - Oliwa Park, named after the poet Adam Mickiewicz, created in the 18th century on the site of the former Cistercian monastery gardens. 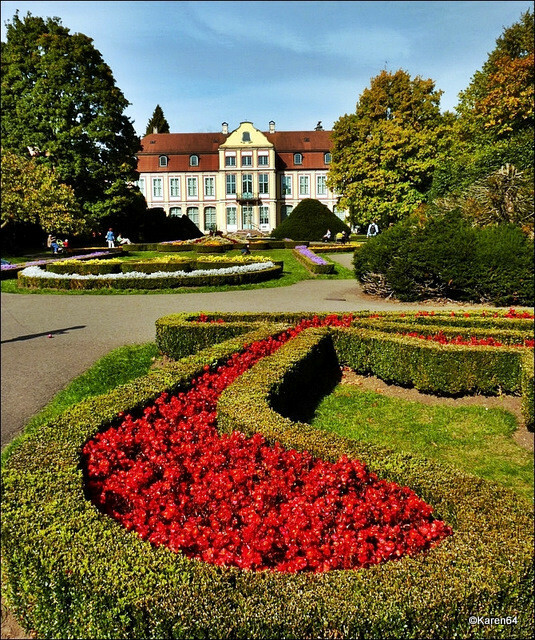 One can come across the specimens of plants brought from all over the world, admire the magnificent, founded in 1920, alpine rock garden, a conservatory, caves of whispers and cascades of Oliwa Stream, 112 - meter long avenue of trimmed lime trees and hornbeam alley, planted in the 17th century. In the park there is a palm house with a famous 17-metre high palm tree. The most spectacular edifices of old Oliwa district is Oliwa Cathedral, the triple-nave vaulted basilica based on the plan of the Latin cross, a longest church in Poland. In the summertime the baroque organ concerts are held there. Strolling through Oliwa Park you can visit The Abbots' Palace (Pałac Opatów) and The Ethnographic Museum. Families with children will certainly enjoy a visit in the nearby Oliwa Zoo. Sightseeing in Oliwa, you can climb its viewpoint called 'Pachołek' and look at the city panorama. 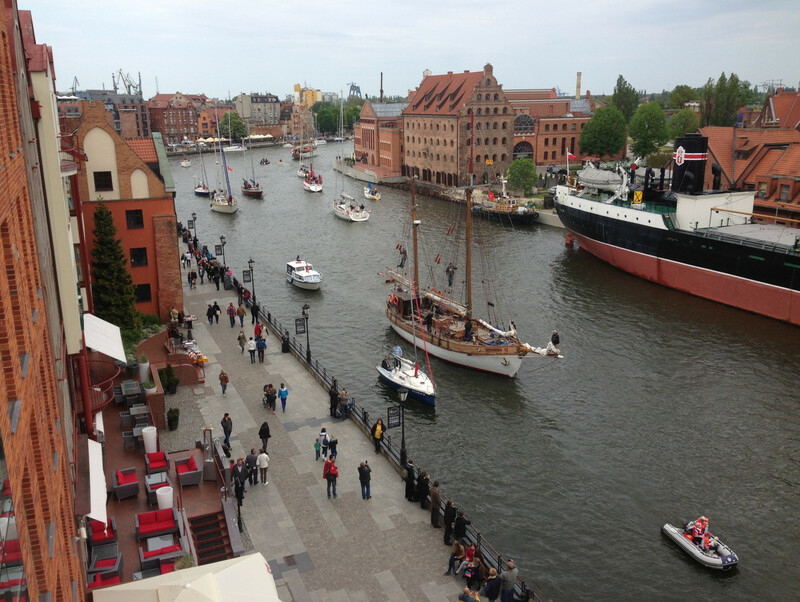 Free access to the viewpoint tower offers you a splendid panoramic view of Gdańsk. Interactive map of Old Oliwa district will certainly make it easier to locate the main points of interest. After a sightseeing tour of Gdańsk we would strongly recommend an idle break at the seaside; nothing is more relaxing than feeling Baltic sand under your feet, listening to the soothing sound of waves or watching the sunset. Stogi or Jelitkowo are places ideal for a walk along the seashore. A trip to the Brzeźno pier is also a good idea - idyllic ambient prevails there both at sunrise and at sunset. Nothing compares to the energizing qualities of the open spaces and the influence of water element accompanied by the benefits of beneficial iodine content in the air. Easier access to the beaches thanks to the map beaches in Gdańsk, Gdynia and Sopot. commonly known as 'Monciak'. Its favourable geographical location is reflected in the real estate prices - the highest in Poland. The city has a great location - lying between the beautiful woods of the Tricity Landscape Park on one side, and the numerous sandy beaches of the Bay of Gdańsk on the other. Its favourable geographical location is reflected in the real estate prices - the highest in Poland. The city has a great location - lying between the beautiful woods of the Tricity Landscape Park on one side, and the numerous sandy beaches of the Bay of Gdańsk on the other. 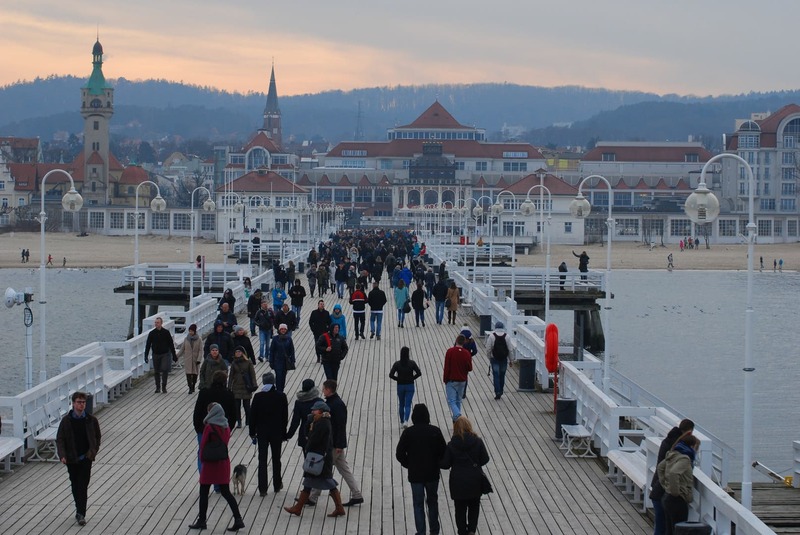 Sopot recreational facilities are visited by hundreds of thousands of guests each year, mainly during the summer season. The status of a health spa makes Sopot one of the most popular holiday destinations for the Polish and foreign tourists alike. 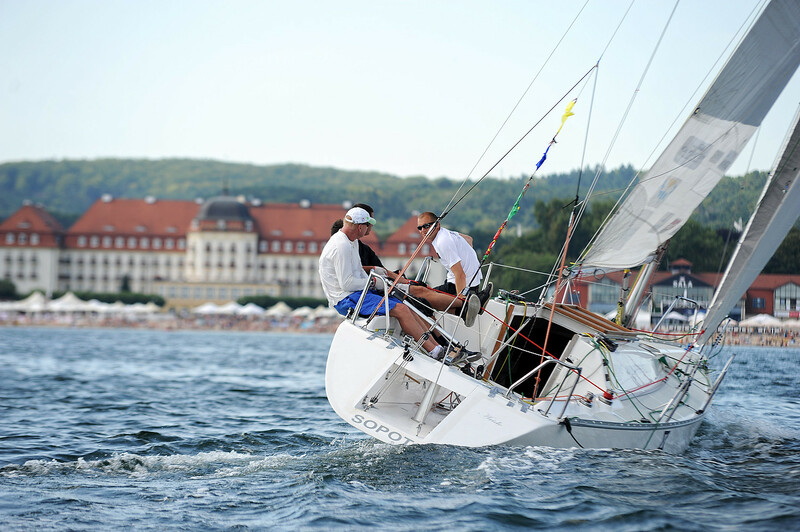 Clean, sandy beaches spread throughout the area of 4,5 kilometres of Sopot coastline. 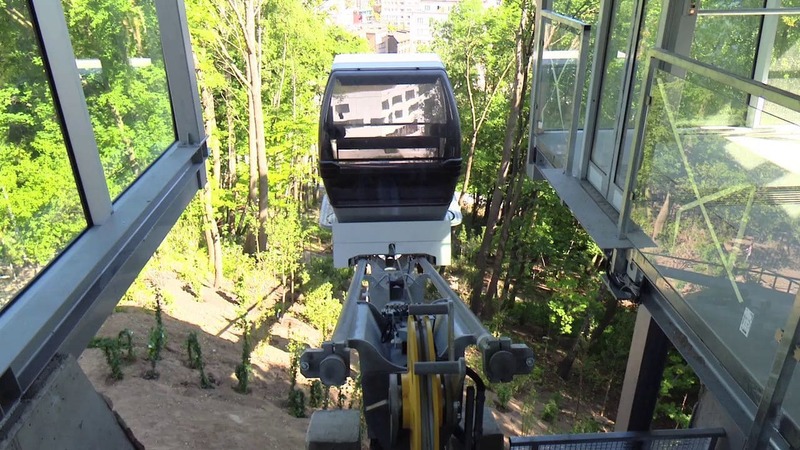 Through the middle of the resort runs its representative Bohaterów Monte Cassino Street, commonly called 'Monciak'. 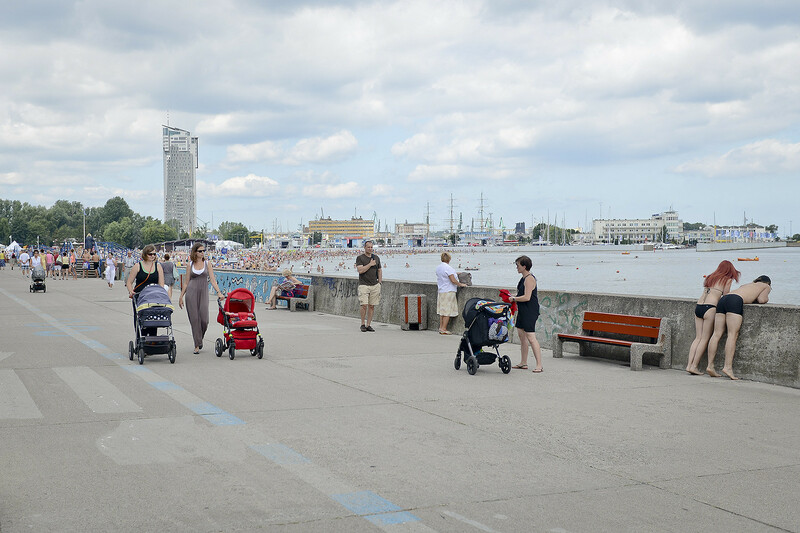 It is the main promenade, vehicle-free pedestrian zone. The ground floors of tenement houses built at the turn of the 19th and 20th century, as well as other more modern buildings, like Crooked House (Krzywy Domek), are now housing cafes, pubs and restaurants. Apart from modern venues we can find here other places, going way back, with artistic and club house traditions. Spatif and Sfinks, clubs located at Monciak have always been the popular meeting places of Tricity artists and celebrities, here the numerous concerts take place and the nightlife flourishes. In the lower part of Monciak promenade new cafes, clubs and restaurants spring up one after another. 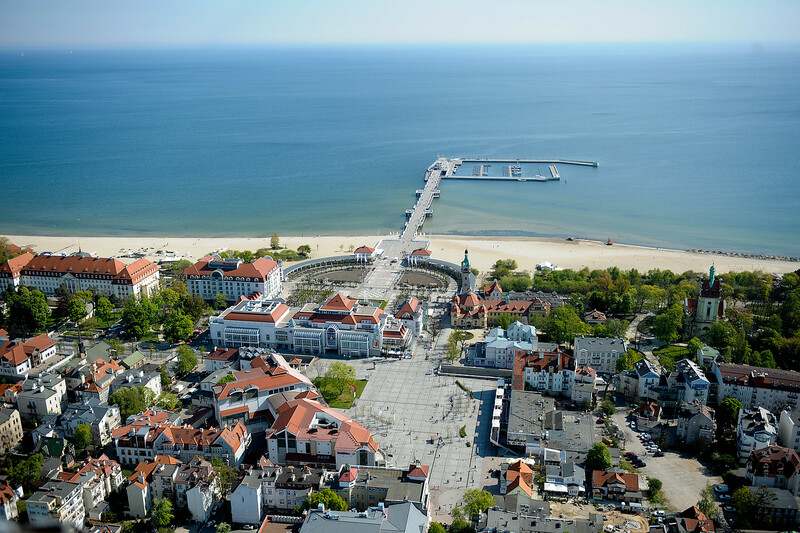 Plac Zdrojowy, the square with Haffener Centre is the heart of Sopot, perfectly matching the urban style of the resort. To discover the real charm of the town, turn into one of Monte Casino's side streets, where you may travel back in time thanks to the surrounding art nouveau houses and gardens. We particularly recommend a walk along Czyżewskiego Street, where Sierakowskich Court At the lowest point of Monte Casino you'll find the Pier (Molo), which is 512 metres long; the longest wooden pier in Europe. At its end there is a marina, full of yachts and catamarans in holiday season. During the summertime, there is a small entrance fee charged if you want to go to the pier, however, visitors do not seem to mind paying for a one of a kind opportunity to stroll along this picturesque place. From there, you can admire the sight of The Bay of Gdańsk, Tricity coastline and the Sopot itself, with its landmark - the legendary Grand Hotel. The places with exceptional charm and magical atmosphere that we recommend to visit are Atelier Theatre named afterAgnieszka Osieckaor Artistic Bay (Zatoka Sztuki), where you can watch a fashion show, see a concert or just sit back and relax with a cup of coffee enjoying the seaview. Apart from the walks in the seaside promenades and boulevards you can go up Castle Mountain (Góra Zamkowa), to see the medieval fort, the oldest historic place in Sopot, the one and only such building in Europe located in the middle of a contemporary city. 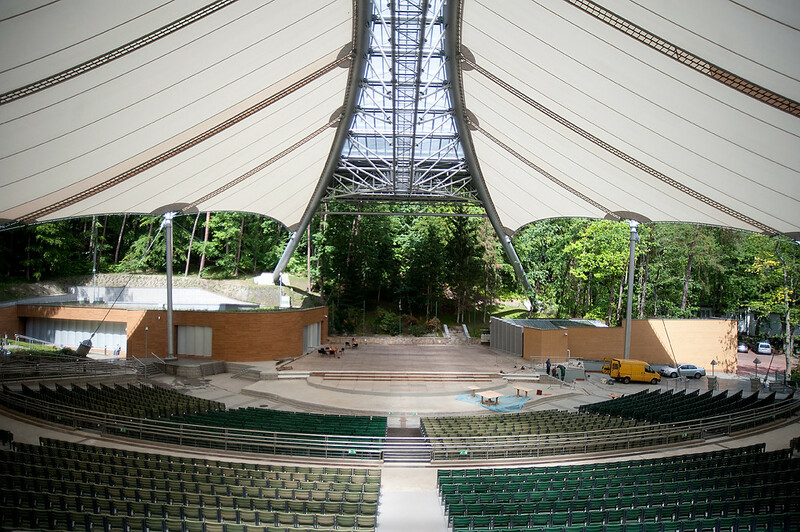 The renovated Forest Opera is also well worth a visit; famous for its interwar Wagner concerts, and since 1961 - for the International Song Festival (Międzynarodowy Festiwal Piosenki). 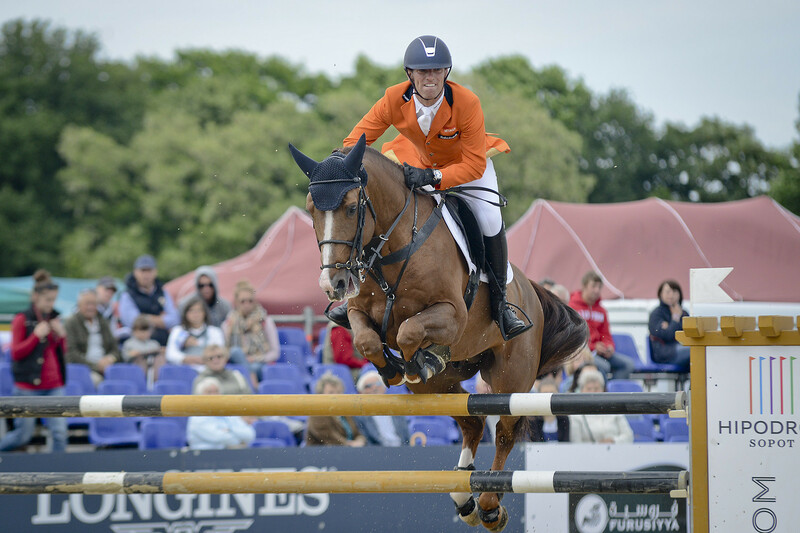 Everyone keen on horse-riding and every enthusiast of sport competitions must absolutely go to the horse racetrack, situated between Gdańsk and Sopot, considered to be one of the most modern horse-riding centres in Poland. The horse racetrack was built over a hundred years ago on a grassy surface of 33 ha. At the time, it used to host international horse-racing events of European rank. For those looking for splashy thrills and aquatic entertainment the visit to Sopot Aquapark will be a great idea. Those of you driving between Gdańsk and lower part of Sopot please have a look at the new ERGO ARENA sports and entertainment centre, where you can watch a basketball or volleyball match as well as see the international stars at concert. Interesting location, the cliffs famous all around Poland, the longest seaside boulevard, Kościuszko Square, historic ships moored by the quayside, wide municipal beach, port cranes, luxury cruise ships, and yacht harbour with hundreds of masts - all these are the elements of a contemporary port city called The Nautical Capital of Poland. 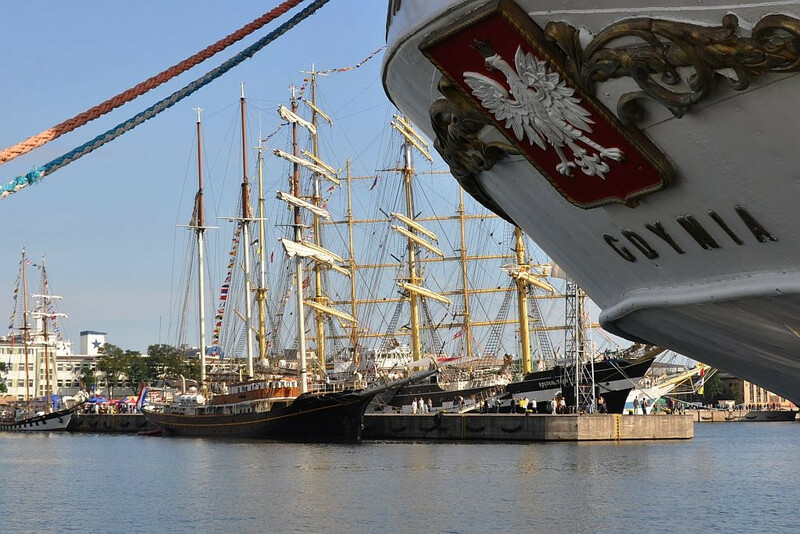 Less than 90 years old, Gdynia is one of the youngest Polish cities. Described as "The city made of sea and of dreams" , it was a dream come true for the people who created it from a tiny fishing village and turned it into a biggest port at The Baltic Sea. The architectural symbol of the city are the two 130-metre high Sea Towers built at the seaside. 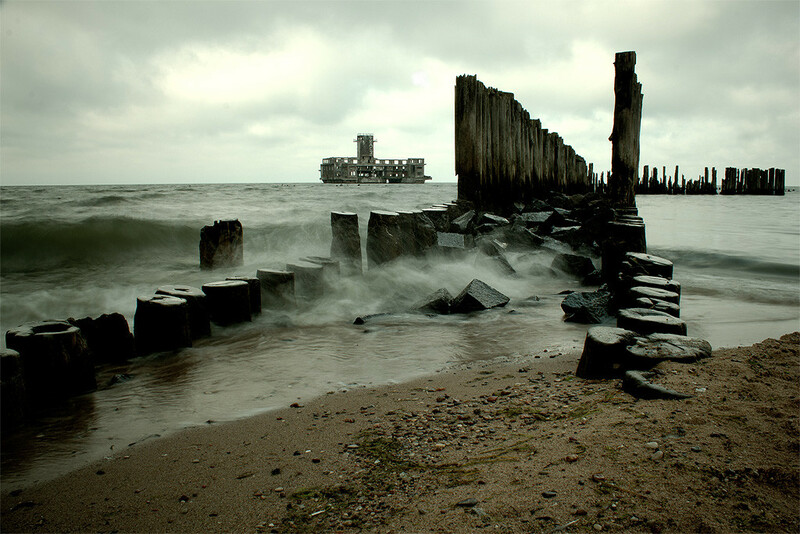 Genius loci is Orłowo district, with its cliffs and the pier. The city's central district - The Stone Hill (Kamienna Góra) - residential area situated on a hill with its characteristic cross and a park with a viewpoint on the centre of Gdynia, the port, The Bay of Gdańsk and the arched shape of The Hel Peninsula. 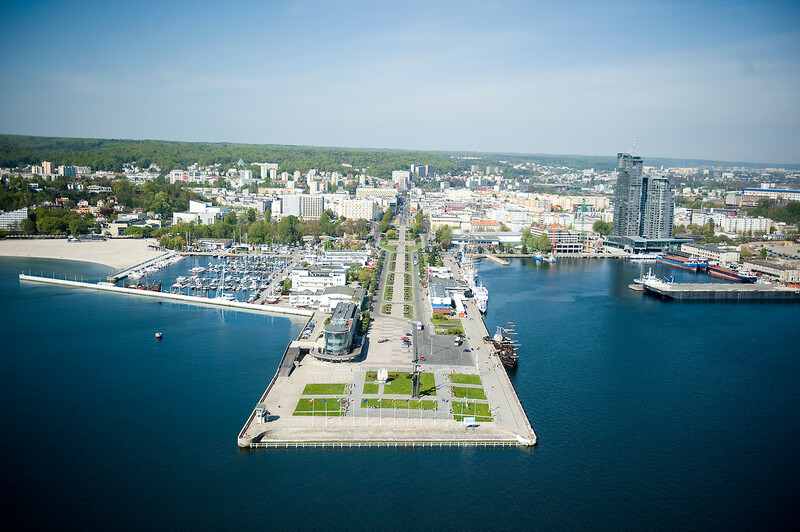 Established in 1926, Gdynia is a young, but quickly expanding port, offering many tourist attractions as well as splendid commercial opportunities and entertainment options. Its diversified and unusual location enables you to come across great views of the sea, long promenades, beautiful waterfronts, marinas and yacht clubs, gems of modernist architecture and other unique places. 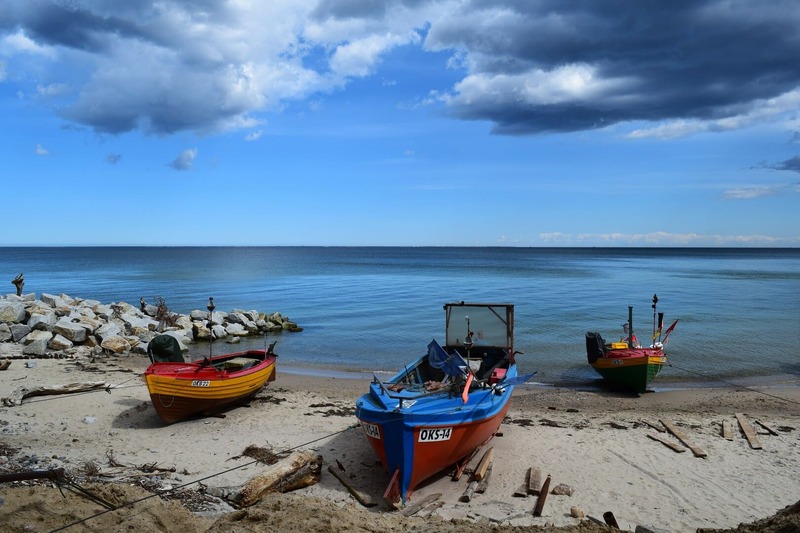 Gdynia is the only city in Poland and one of the very few in Europe to pride itself on such a long and easily accessible seashore, (measuring 12,5 kilometres, not including the port area) The city shares a common transportation system with Gdańsk and Sopot - SKM trains. From Sopot there is a direct trolleybus service, a means of transport used everyday by the inhabitants of Gdynia Sightseeing of "The city made of sea and of dreams" the tourists usually begin from Kościuszko Square, the most famous square in the city, situated between Świętojańska Street and 10 Lutego Street. In the square there stands a monument commemorating The Pope John Paul the 2nd and his visit in Gdynia and the memorial plaque Polish Seafarer ("Marynarz Polski") at which official ceremonies are held. The characteristic feature of the square is the fountain. The extension of Kościuszko Square is The Southern Pier (Molo Południowe), from which it is most convenient to watch the high-rise buildings - SeaTowers and the Gdynia Waterfront facilities, currently under construction. The Southern Pier is a man-made artificial peninsula - jetty. The Pier was built in the 1920s and quickly gained the reputation of the most picturesque spot of the city. The greatest tourist attraction are the historic vessels moored at the quayside: the only preserved Polish pre-World War II ship, and the oldest destroyer in the world today ORP Błyskawica (the most frequently photographed object in the Pomeranian region) and the most famous tall ship, over a 100 year-old Dar Pomorza, today a museum-ship. 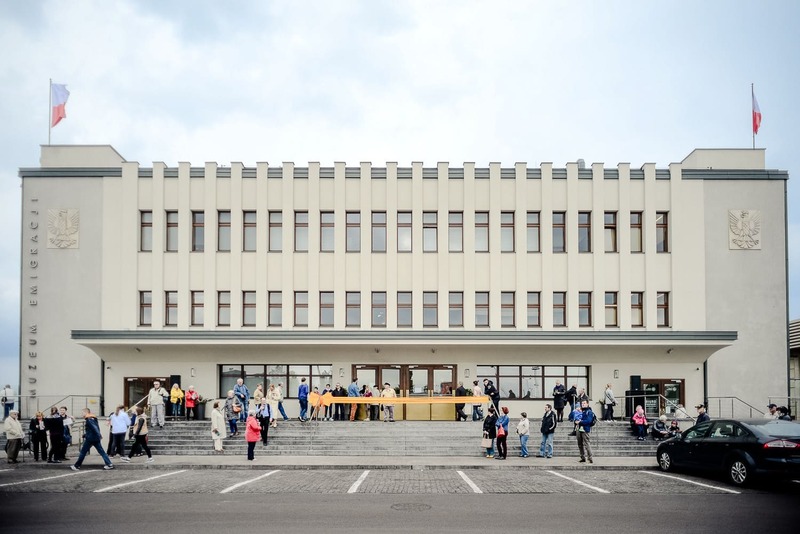 The prime example of modernist architecture of Gdynia can be noticed in the building located in the vicinity, formerly functioning as The Polish Seafarer's House (Dom Żeglarza Polskiego) , nowadays the seat of Maritime Academy Faculty of Navigation (Wydział Nawigacyjny Akademii Morskiej). At the end of the square there is The Aquarium, where the mysteries of the ocean depths are revealed to its visitors. Here you will see the most extraordinary species of fish, amphibians and reptiles from all over the world: Africa, North America or Northern Europe. On the Southern Pier you may walk along the 'Alley of Passenger Ships' - the only such place in Poland, where the green granite plaques commemorate the arrivals of all passenger ships in Gdynia. The plaques are assembled on the Southern Pier. Try to spot here the statue of a boy, called the 'wave conductor', who welcomes and bids farewell to sailors in the marina. 2-metre tall statue stands on poles stuck into the sea bottom about 40 metres away from the shore and is best seen from the Southern Pier and from the marina. From Kościuszko Square it is a good idea to walk along the Seaside Boulevard (Bulwar Nadmorski). 1500 metres long boulevard, or promenade, runs between the slope of the Stone Hill and the sea. It was built to protect the steep cliff and today it is the favourite place of the enthusiasts of cycling, roller-blading, running and nordic walking. Close to the Seaside Boulevard and the beach, there is an attractive outdoor exhibition of weapons and marine armaments. It contains the exhibits of weapons and combat equipment ranging from the 17th century to the present day. There is a particularly rich collection of weapons dating back from the World War II and post-war period, including the the Navy airplanes and helicopters. 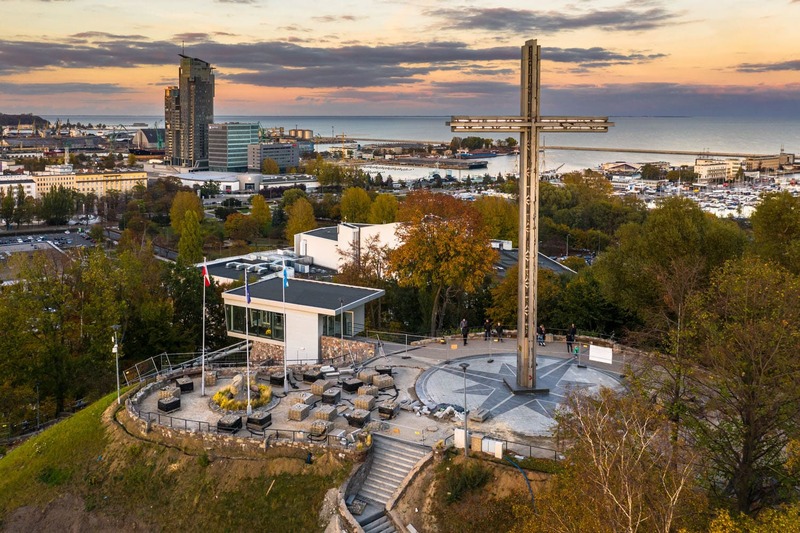 The city's wonderful panoramic view can be admired from the most luxurious districts of Gdynia - the Stone Hill, easily recognizable by the large cross at its top. You can get there by a cable car (cable railway). On your way there, you will pass the famous Musical Theatre (Teatr Muzyczny), and the new seat of the Gdynia City Museum. Back from the waterfront, in the centre, there is a place called the Observatory of changes, a.k.a. Infobox, where you can watch the square and the sea from above and take a closer look at the city miniature model and all its highlighted landmarks. Just a few steps away, in Starowiejska Street, there is a house called The Abraham House , where the Kashubian activist Antoni Abraham once lived. Today it houses additional exhibition rooms of Gdynia City Museum, where it is possible to see the exhibition entitled "Before the city was built. Households of the past". Speaking of Kashubian - now you can take a break and sit on a bench in Kaszubski Square, next to the silhouettes of the elderly Kashubian couple. The next stop could be The Marine Station, built in 1933, regarded as one of the most interesting historic places in Gdynia. Until the outbreak of war it functioned as the base for the transatlantic fleet. In the Station's interior The Emigration Museum was established. From the centre and Świętojańska Street, always pleasant to walk on, we go to Orłowska Street starting the stroll towards Orłowo district. 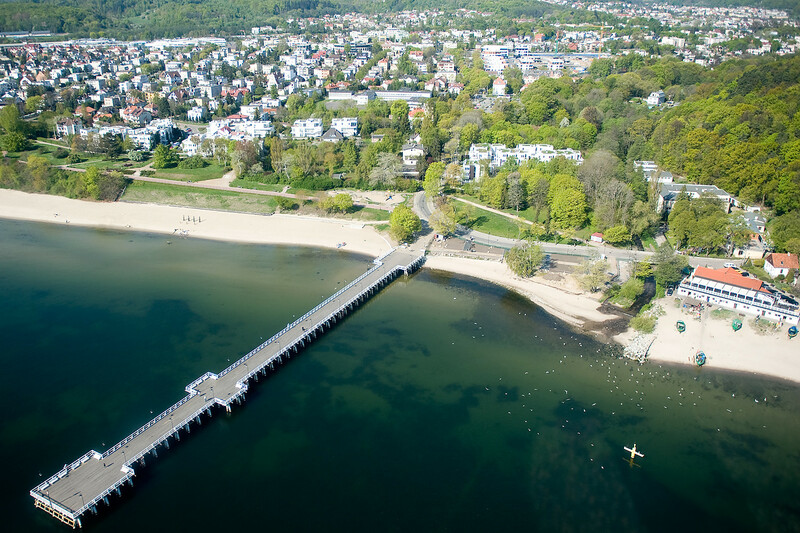 Walking down the street we go past the stylish Villa Lubicz guest house and in the distance we can see the 180-metre long wooden pier, built in 1934. It is one of the most charming places, eagerly frequented by the inhabitants of Gdynia, Gdańsk and Sopot and tourist. No wonder, as the view of the surroundings from there is amazing: not only the wildlife reserve, Orłowo Cliffs, but also Sopot, Gdańsk and Hel Peninsula are visible. The 60-metre escarpment is considered an identifying symbol of Gdynia, being one of the most frequently photographed natural sites in Poland. Next to the entrance to the pier (free of charge) we come across a fishing harbour. Banners fluttering in the wind, fishing nets drying in the sun, colourful boats on the shore make this place unique, often serving as a background of wedding photo shoots and other photographic locations. Turning right from the pier, crossing the bridge over The Kacza river, we reach the building called Adlerówka on our left. At present it is the seat of the gallery of the Arts School Complex (Zespół Szkół Plastycznych) there is also the cafe. Further on, we go past the Żeromski House, in which the writer, enchanted by the beauty of the place wrote one of his novels. Next we pass the former Dom Zdrojowy - a health spa, functioning under a German name of 'Kurhaus'. Back to the pier, we walk along the Queen Marysienka Boulevard.. On the left we pass the spot where Municipal Theatre of Gombrowicz each summer puts up its seasonal stage. After reaching the end of the boulevard continue your walk across the forest until you get to Kolibki Park. Several points of interest,worth mentioning here, are: over a 100 year-old Marysienka's Oak, the remains of the cave named after Queen Marysienka and the historic Palace Complex with watershed and stables. 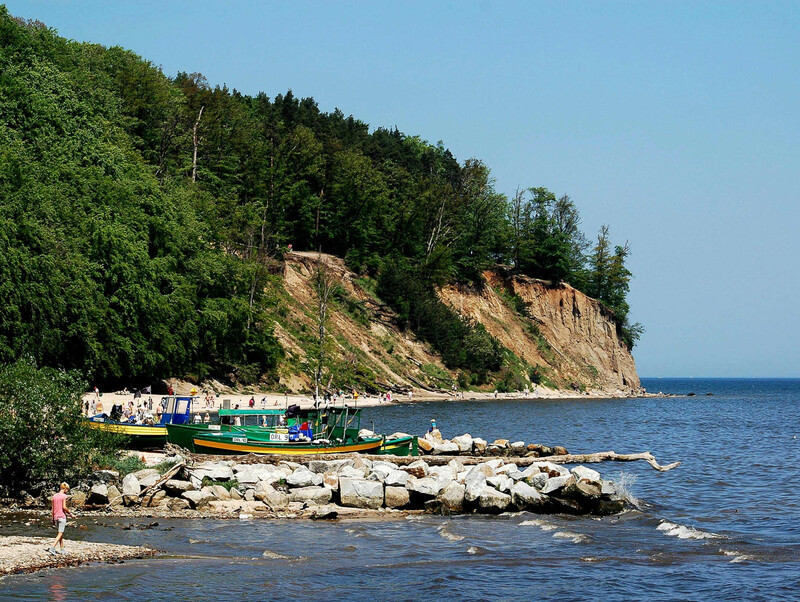 During an excursion to Gdynia it is also recommended to see the old fishing village in Oksywie. In that part of the city you can come across historic, several hundred-year old buildings, like the 13th century church of Archangel Michael Everyone fond of history, military objects, photography and beautiful views will appreciate a visit in Babie Doły. There, about 300 metres away from the beach, you can see a place called 'Torpedownia'. Built by Nazi authorities during World War II, it served as the assembly line for torpedos and as the firing range. It is one of the most fascinating attractions and one of the most photographed objects. Another exciting outdoor activity is a trip to St. Nicholas Hill in Gdynia Chylonia, located just next to Morska Street. From this appealing and mysterious place called The Holy Mountain (Święta Góra) it is not far away to Motorization Museum, where you can enter the world of shiny vehicles which used to move around the streets of Gdynia in the 1920s or 1930s. The place is perfect for motorization fans. Looking for entertainment and indoor family attractions it is good to remember about the new scientific and entertainment centre Experyment, where learning and playing are rolled into one fun way of spending free time. EXPERYMENT consists of more than 40 interactive stands explaining the phenomena occurring in the world around us. Your virtual trip around Tricity is about to end.  If you wish to see more photos of Tricity please visit our photo gallery. In our guide we presented only the most important and most characteristic places associated with Gdańsk. Obviously , our list is not finite nor complete. Tens of other less popular monuments, buildings, enchanting places and lovely alleys still await someone who will discover them and bring them to public attention. By presenting one by one the attractions of Tricity and updating data on the presented items we aim at constantly developing our guide. Perhaps you have also found a place in Tricity, which wasn't mentioned here and which has made a great impression on you. We will be grateful for all your suggestions and comments, Please send all suggestions and comments to: przewodnik@trojmiasto.pl.